Walking into Tree of Life for the very first time, there is a sense of oxygen and life. You almost have to ask yourself if you missed a memo informing everyone that downtown Fresno was finally comfortable with being ‘trendy’. On the corner of Kern and Inyo street is the Hotel Virginia; a historic hotel that has recently undergone an adaptive reuse and is now a commercial building. On the ground floor of the old hotel is The Tree of Life; a quirky blend of nature and food. Without knowing what the Tree of Life is, the interior design of the restaurant makes it clear what they do. 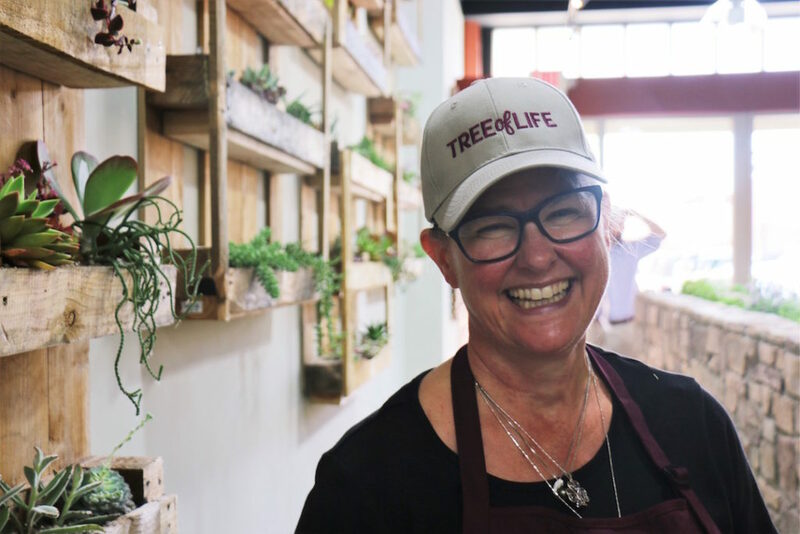 Last week, we sat down with Owner and Executive Chef, Carolyn Ocheltree to talk more about what makes the Tree of Life just a little bit different from everywhere else in town. “I’m a baker. I love to bake pies, breads, cookies, and wanted to bring that to downtown.” She explained a big emphasis on what they make are gluten free products. But that is not her main reason. Carolyn and her husband Steve, who is a partner at a downtown CPA firm, have had the desire to employ men and women who have come out of drug and alcohol addiction and have gone through rehabilitation. They wanted to offer a solid place to employ men and women so that when those drugs and alcohol come knocking again, they feel as though they have a job to get up and look forward to rather than going back to their old ways. Carolyn and Steve had been praying on what would be the best business for them to start, and shortly after, the Downtown Fresno Partnership came out with a contest called ‘Create Here’ last Spring, which was designed to stimulate business in downtown. The Ocheltree’s hope for the Tree of Life will change people’s perceptions of addiction and Fresno itself. You can somewhat draw a parallel between how Carolyn views her staff and downtown Fresno. She wants to “plant seeds downtown;” some metaphorical and some not. She feels as though they have planted a tree downtown, and would love to see it expand and have different branches in different places. With the addition of wholesale baked goods which is being added as an extension to the restaurant, the Tree of Life is a business that understands what it will take to make downtown Fresno more viable. It is companies like Carolyn Ocheltree’s that will be the backbone of Fresno’s latest restoration attempts. If I could pick one word to describe Carolyn it would be, ‘nurturing’. Webster’s dictionary defines ‘nurture’ as “the care and attention given to someone or something that is growing or developing.” This could not be more true for Carolyn in every aspect of her life; wife, mother, Fresno resident, and entrepreneur. I enjoyed every moment I was able to spend with Carolyn and her family at the restaurant. I cannot wait to come back for many lunches to come. The Tree of Life mission statement is, “To delight our guests at Tree of Life Café & Bakery by telling them the story of our Great Valley through our family and food. We want to see renewal and restoration in our people and in our city.” Mission Accomplished.